For those that do NOT like the look of the Windows 10 Start Menu. 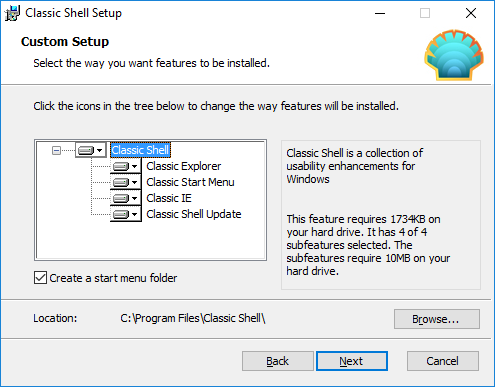 Here is what you need to do to get the classic start menu on your Windows 10 machine. I’ve installed Windows 10 on all my machines at home. I don’t have any complaints about how Windows 10 operates. Like everything else in life, sometimes you have to adjust to new things. However, I know that isn’t however everyone else feels, especially about their computer equipment. I’ve heard everything from “If it ain’t broken why fix it”, to “I want what I’m used to”. So for those who have now installed Windows 10 but want to make it feel like what you were used to with Windows XP or Windows 7, here is what you need to do, for FREE I might add, to give your Windows 10 install that Classic feel. 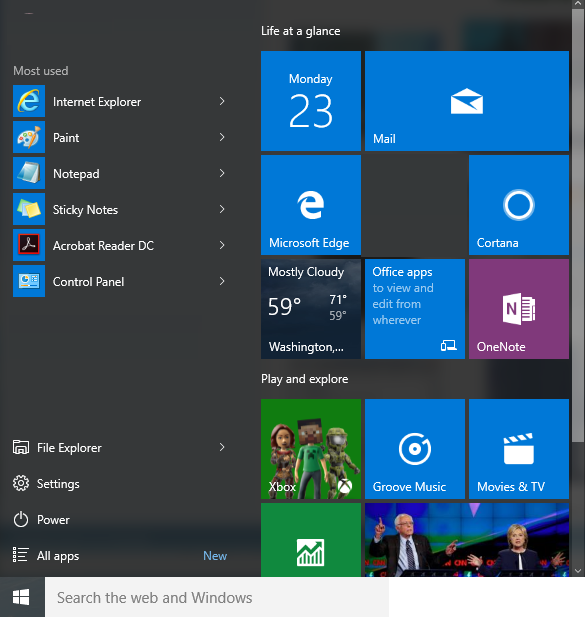 Currently when you install Windows 10, you will find a completely redesigned Start Menu. A mix of menu items and “live tiles”, basically a hybrid of Windows 7 and Windows 8 Start Menu’s. 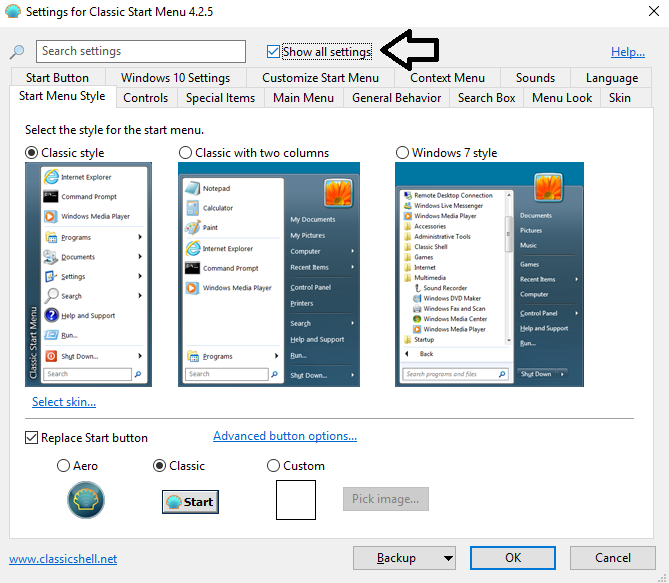 So for those who would like to go completely back to the old Start Menu (the what you are used to menu) here is what you need to do. 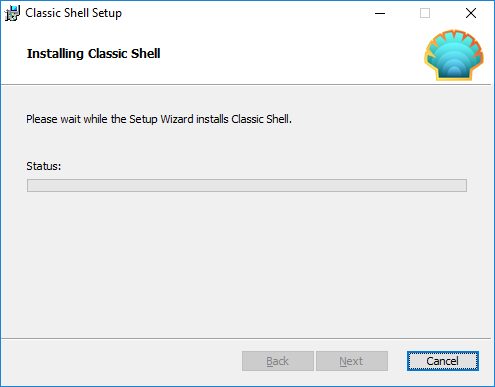 Install the Classic Shell update. 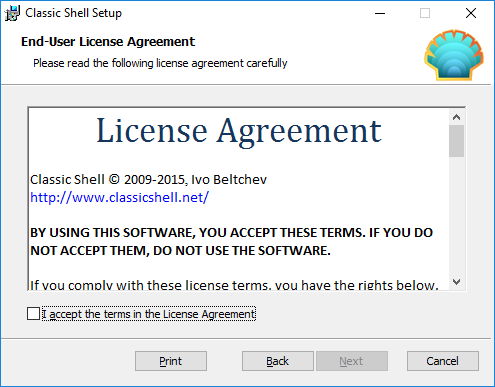 Classic Shell started as a small utility in 2008 by someone who did not like how the start menu in Windows Vista worked. 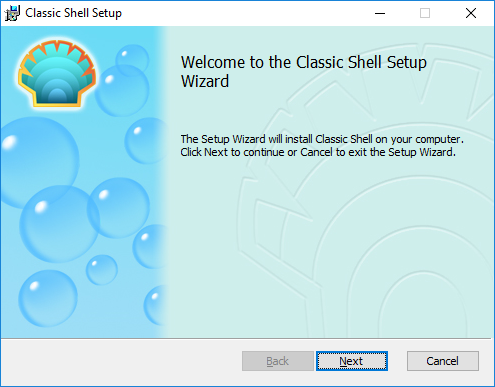 Classic Shell update is open source and free (if you like it, they would appreciate a donation to support the project). 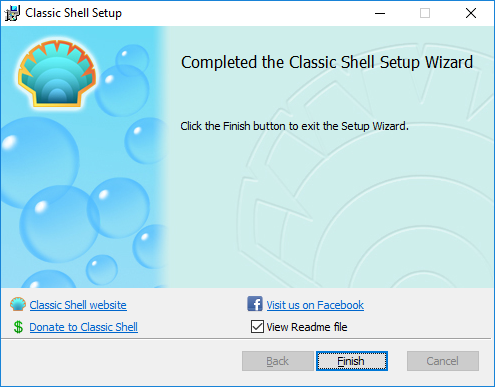 Start by visiting the website for Classic Shell. On the home page you will find 2 primary download links. 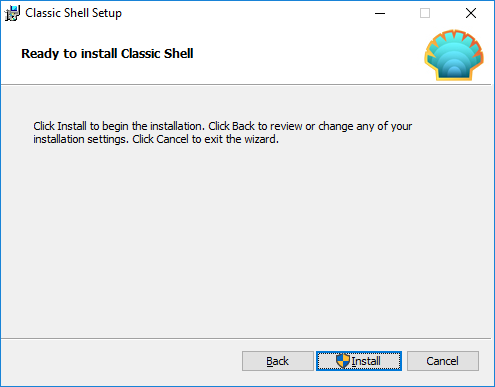 The one that says Download now is the main download for Classic Shell, this will download the latest stable version of the update. For those looking to be on the cutting edge, Download Beta will let you download the latest version which is still being developed. 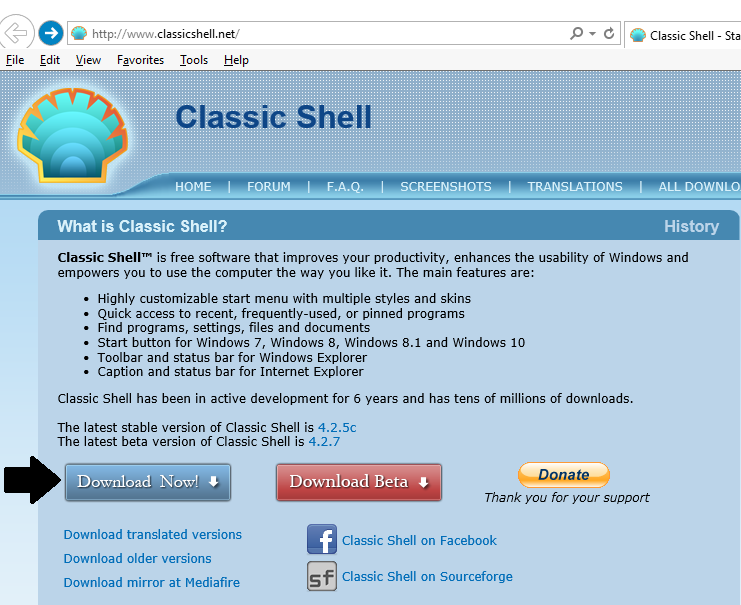 In addition, on the main page you will also see links for translated versions of Classic Shell. 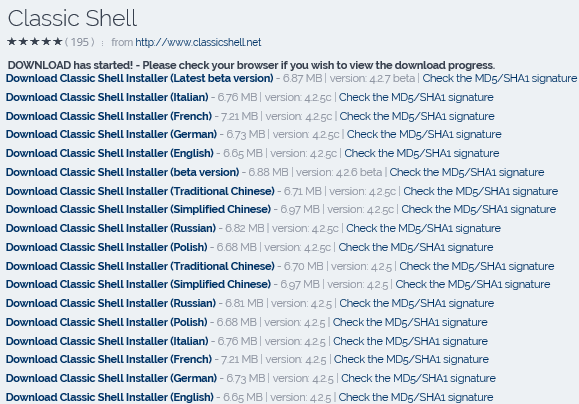 If you need a translated version, Classic Shell is available in Italian, French, German, Chinese, Russian, Polish, and Spanish (among other languages). Now you will see a custom set up window. You don’t have to touch anything here. Just hit next. On the window that follows, the ready to install windows, hit the install button. Once the installation screen is done you will get the install is complete screen. Uncheck the “View Readme file” box (unless you like to read such things) and click finish. and you can also select to replace the start menu button with one of the buttons listed at the button. If you want to be Geeky, you can put a check in the box that says “Show All Settings” and you will get a multitude of customization options. There are to many options to mention all of them, you will just need to go through them and see, the good news is most of the custom choices are easy to understand. Just remember if you do make custom changes, make a note of each change, so that if it isn’t the desired effect you can change it back. 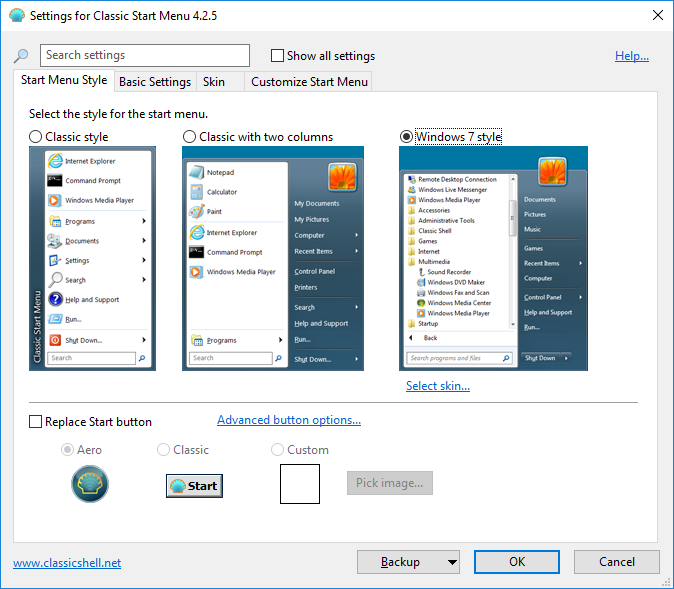 Either way once you have made your selection, you will have a new (classic looking) start menu.